Since I did a number on my knee I've been looking all over the internet for more 'Teer can't walk in those crazy high heels right now' shoe and I've come across some rocking styles. I'm getting better so expect those 6 inch heels back shortly! I know many of my readers have wider feet so I wanted to share a few funky styles I've recently found from Clarks in the UK along with a few standard styles for my standard width girls. 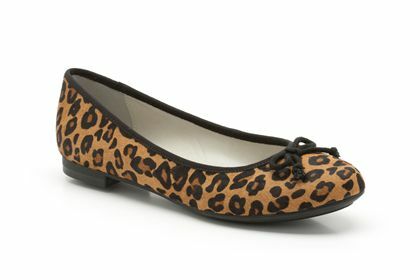 I'm loving this leopard print ballet flat as right now flats are my daytime friends. These with my favorite skinny jeans are purrfect match. 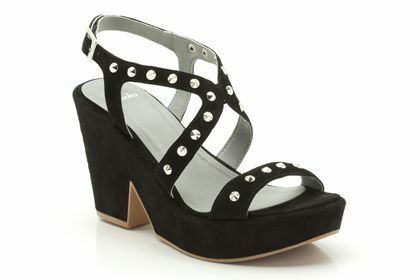 Classic black Mary Jane style high heel with a very vintage feel. I love the cut out detail and the suede fabric. These will pair with absolutely everything in my wardrobe. 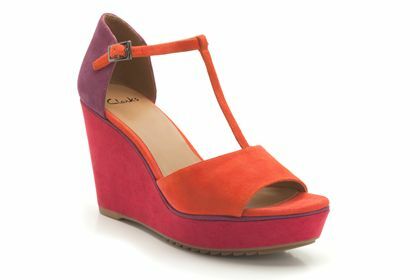 A bright colour blocking wedge will make any outfit pop that little bit more. From summer dresses to just jeans and a tank top these wedges are super easy to style. Oh how I adore studs! Stud everything and I will be over the moon! 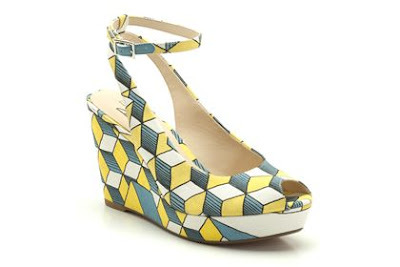 Loving the cut out wedge detail and these would be the perfect style shoe for me to walk in right now. How funky is this print? So bright and geometric I adore it. I would pair these with my favorite blue jeans and either a yellow or blue peplum top. I just bought the Clarks Concert Ticket shoes! They were hard to track down in a 37 but I found some eventually. The navy ones are super nice too. Want those! The black ones will be my perfect winter shoe - easy to trek about in with a covered toe and heel so they don't look funny with my seamed stockings ;-) Oh and straps so they dont fall off the foot. I bought those Concert Ticket shoes a few weeks back - perfect for work but still with a vintage feel. Love them. 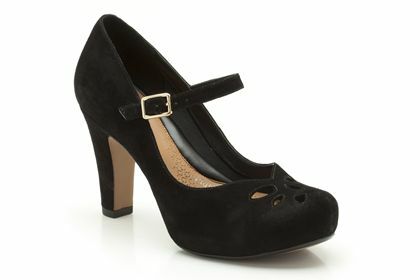 The suede mary-jane are lovely!